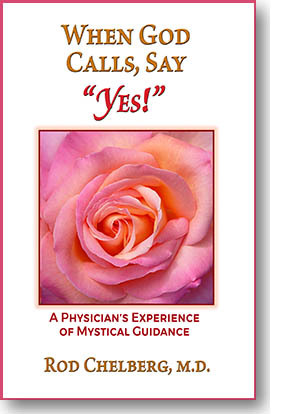 In my memoir WHEN GOD CALLS, SAY “YES!” I share my first childhood memories of mystical events. Later in life, once I was in medical school, these mystical events became more frequent. I started to see and hear Christ in the ER where I worked as a physician, and there He guided me to help save many people’s lives. When I later became a hospice director, Christ helped me care for patients and then guided them home to heaven. In the book, I discuss the unreality of death and dying in detail, citing multiple patient cases. Meeting God is another major topic of the book. I share what it is like to be held by God and look into His eyes and feel His Love for me. Eventually I realized that God and I are one. In time, I was asked to join Jesus and others to bless the world. Finally, in closing, I have given suggestions about what worked for me in the process I call Awakening. In this small book, I have included several poems, letters to friends, and examples of Christ talking with me. What I learned is that Christ’s help is readily available to everyone whenever we ask for it. But the main point that I am making in this book is how much God Loves us and is waiting for us to wake up! ROD CHELBERG, MD has been practicing different forms of General Internal Medicine for the past 28 years. During that time, he saw over 70,000 patients. He spent 14 years practicing emergency room medicine and was the medical director for several years at St. Joseph’s Hospital in Bangor, Maine. Following this, he became the medical director for four nursing homes within the Bangor region, as well as the medical director for Beacon Hospice, where he was responsible for 100 to 150 patients at any given time. Rod is currently retired from medicine and is now an adjunct faculty member at the University of Maine within the biomedical engineering program. He also lectures occasionally on the topics of mysticism with Dr. Jon Mundy. He has also been featured on Unity Radio, has given presentations on You Tube, and has also written several articles for Miracles Magazine. In grade school, we used to watch movies on projectors using metal reels. There were a Multitude of pictures in sequence on celluloid film. When the film occasionally jumped the reel, the picture on the screen would shift, blur, or even burn up on the screen. (We always cheered when this happened.) In a similar manner, my vision shifts suddenly and I see the world from a new perspective. In what I call a “frame shift,” time and space momentarily skip on the reel of life. These subtle, sudden frame shifts are often preceded by a very soft “click.” Over time, I became aware that these shifts are simultaneous with my becoming aware of Christ’s presence. In terms of the Course, these are “holy instants” where Christ reaches through the spiritual dimension to me, into this limited human dimension. It is a joining of my mind with the divine, the effect of which alters my perception of this human world. These frame shifts were my very first spiritual sense to de-velop, and are roughly equivalent to our human sensation of touch. Christ’s presence is almost palpable when he enters into my awareness. It feels as if He is touching me on my right arm, and from that touch I become aware of Him near me. I subsequently learned that before every mystical experience, I would have a frame shift. I suppose one could call this Christ knocking at the door. Once I open that door, a whole new line of communication is available to me. This is a spiritual form of communication, a joining of my mind and heart with Christ. Once joined, His presence extends from my heart to all those around me. This form of communication is silent and without words; we are all enveloped by a feeling of Oneness and deep peace. I know that we are all in the presence of something very holy and mystical. One young woman was brought in to the emergency room with complaints of right lower quadrant abdominal pain. She found it difficult to walk, but had no nausea or vomiting. She was seen in another emergency room the previous day, where she was started on antibiotics. As she lay on the gurney, I saw a haunted look of pain and fear in her eyes. As I talked to this young lady and her mother, a frame shift occurred. I felt the presence of Christ entering the room, and as a result we all started to feel peace. As I looked down at her right side, I could see that she had acute appendicitis by the way she was positioned on the gurney. I touched her mother’s right shoulder, but kept eye contact with my patient. I told them both of my diagnosis, and that very soon she would be pain-free with the medicines that I was going to give her. Upon talking to me, she immediately felt relief, as did her mom. I was happy for that. But in reality, it was the flow of Christ’s love to them that brought them both relief from fear and pain, because she felt much better even before I gave her any medicine.